Pineapples (Ananas comosus) are native to the Neotropics and had been domesticated and distributed throughout the Caribbean by the time Christopher Columbus encountered them there. Columbus’s armada managed to keep one pineapple from rotting on the trip back to Spain, whereupon King Ferdinand declared it his favorite fruit. Immediately, the pineapple became the ultimate tabletop accessory for royalty and aristocracy, first in Spain, then throughout Europe, and, eventually, temperate North America. Whole insanely expensive industries popped up to grow pineapples in heated glass houses for the rich to display ostentatiously in their homes (O’Connor 2013). In the tropics, a pineapple plant—a large, spiky herb in the bromeliad family (Bromeliaceae) – takes somewhere between 5 months and a year to ripen its pineapple fruit (Lobo and Yahia 2017). In European glass houses in the 16th– through 19th-centuries, the ripening process took nearly two years, producing a few precious fresh fruits to augment the small number of fresh and preserved pineapples that managed the oceanic crossing (O’Connor 2013). Acquiring—or renting—a pineapple to prominently display for a celebration, then, required serious cash. 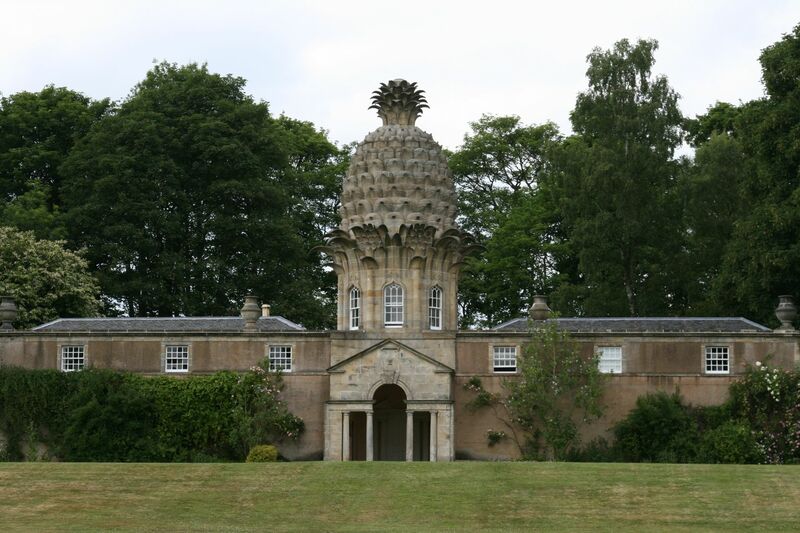 Some aristocrats went so far as to flaunt a ripening pineapple by surrounding their glass houses with pineapple-shaped statuary and topiary. “Pineapple” was a term of endearment during the period. Supposedly, pineapples proliferated in reality and art because they became a cultural symbol of hospitality (looking at you, Williams Sonoma), but, really, showing off pineapple in some way was also a status symbol. It didn’t hurt, of course, that pineapples taste and look complicated and powerful, completely unlike any familiar temperate fruit. For better and worse, improvement of industrial pineapple cultivation, canning, and shipping – moved forward most dramatically by James Dole’s efforts in Hawaii in the early 1900s – brought pineapples within the grasp of the temperate unwashed masses. Plebian popularity engendered some measure of cultural ambivalence in the higher latitudes, displacing pineapple from the modern holiday table and relegating it to a grocery store fruit plate or the back of a ham. Or, at least, that had been pineapple’s fate up until very recently. What’s old is new again, and holiday pineapple centerpieces are suddenly all the rage. Here we’ll give you the tools you need to distinguish yourself as a host amidst this influx of showcased bromeliads. In addition to hospitality, offer your guests some fascinating botanical trivia. A pineapple is a complicated amalgamated botanical structure. We colloquially call a pineapple “a fruit,” but this isn’t strictly botanically correct. To a botanist, “a fruit” is the mature ovary from a flower that contains (or could contain) seeds. Biological structures and organisms are notoriously difficult to neatly categorize or define, though, and this is true when it comes to fruit and the history of botanists’ efforts over time and place to describe them. Many single flowers, for example, have multiple ovaries. As these ovaries mature into fruit, they might cohere in a composite structure, as in blackberry, or get separated by the expansion of a fleshy structure supporting them, as in strawberry. Other plants make flowers with a single ovary each, but the plant might array many of these flowers closely together in a tight cluster. The fruits that mature from these single-ovary flowers on such an inflorescence might develop discretely, as with banana, or they might inextricably merge into a single structure. Such is the case with pineapple. The fruit of a single pineapple flower is classified botanically as a “berry,” a uniformly fleshy fruit that develops from a flower with a single ovary. Cranberries and blueberries, tomatoes, elderberries, and grapes are also botanically bona fide berries. An individual pineapple berry is inferior, located within the base of the flower (the receptacle) and below the whorls of sepals and petals that surround it. In fact, beneath each spiny shield-shaped bump on the pineapple surface lies a hidden berry. 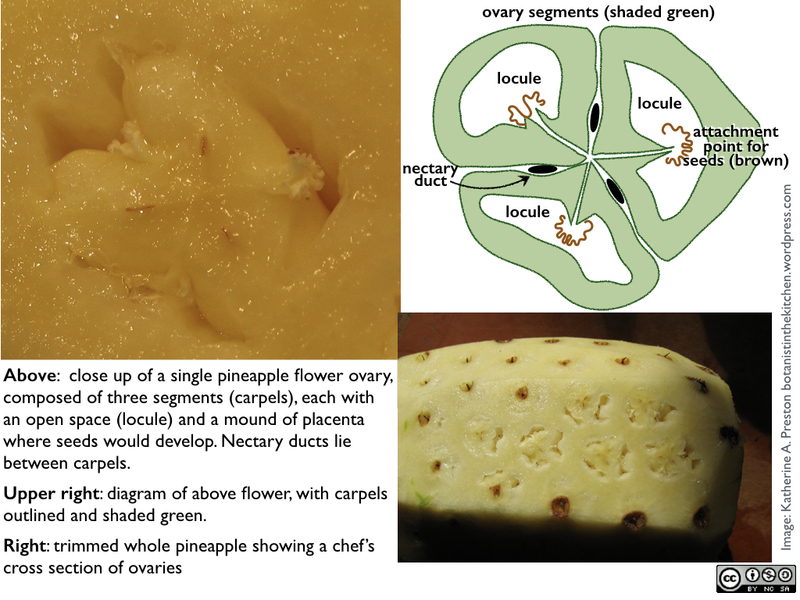 As any inferior ovary develops into a fruit, the receptacle tissue fuses with the ovary wall to create what botanists call an “accessory fruit.” Therefore, each individual pineapple fruit is both a berry and an accessory fruit. For details, please see our posts about other fruits with inferior ovaries (apple, pumpkin, pomegranate, pear, banana). Our pomegranate essay also includes an expanded discussion of tissues other than the ovary wall and pedicel or peduncle (special stems that support the flower or flowers) that sometimes become the sweet, fleshy “fruit” that entices animals, including us. A whole pineapple is a collection of 50 – 200 berries, tightly packed around a stout stem segment and nestled into the fleshy tissue that supports them. Botanists have not completely agreed upon terminology to describe various amalgamated fruit structures. The words “multiple fruit,” “aggregate fruit,” or “compound fruit” have variously been used to describe structures that are like blackberries, strawberries or pineapples (Spjut and Thieret 1989). We’ll not take a stand on the issue at this time. Fortunately there is a more specific term for “fruits” like pineapples, jackfruits, and mulberries, whose fleshy parts include their supporting stalk: sorosus (from Greek for heap) (Spjut, 1994). Okay, so what are we looking at? The best way to understand the structure of a pineapple is to cut one up, but pineapples don’t make it easy. 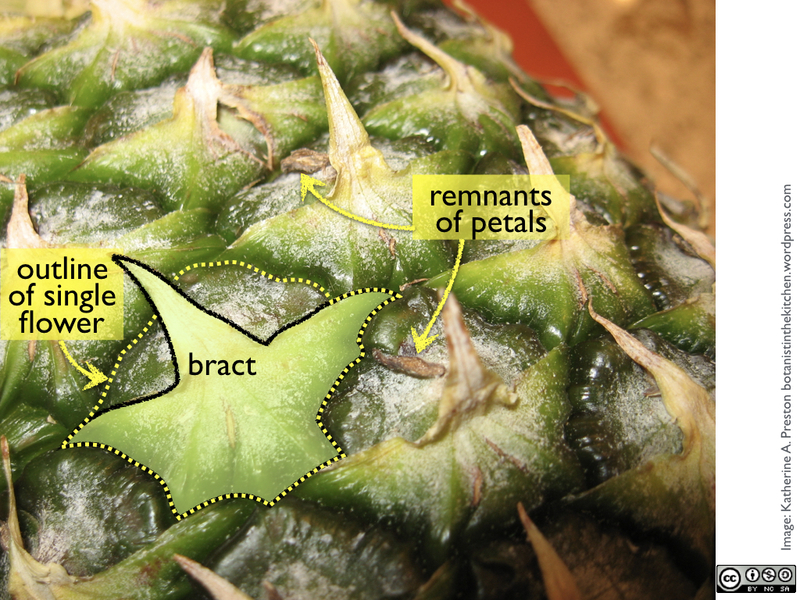 After flowering, pineapples defend themselves well by encasing all their sweet fleshy coalesced berries in a spiny armor of stiff bracts and thick sepals. Throughout ripening they also guard their fruit with numerous tough pointed leaves growing from the tip of the inflorescence above the flowering section. This spiky profusion at the top of the pineapple is called the crown. Commercial pineapples do not make seeds and are propagated vegetatively, from either the crown or side shoots. Before diving into the edible part of the pineapple, you should cut off the crown. Although it is tempting to use it as a handle, doing so will leave your arm covered with irritating scratches. New pineapple flowers attract hummingbirds with three very long purple-red petals that overlap to form a tube. Unfortunately, the bright petals have long shriveled away by the time we share photos of our festive bromeliads with the internet. 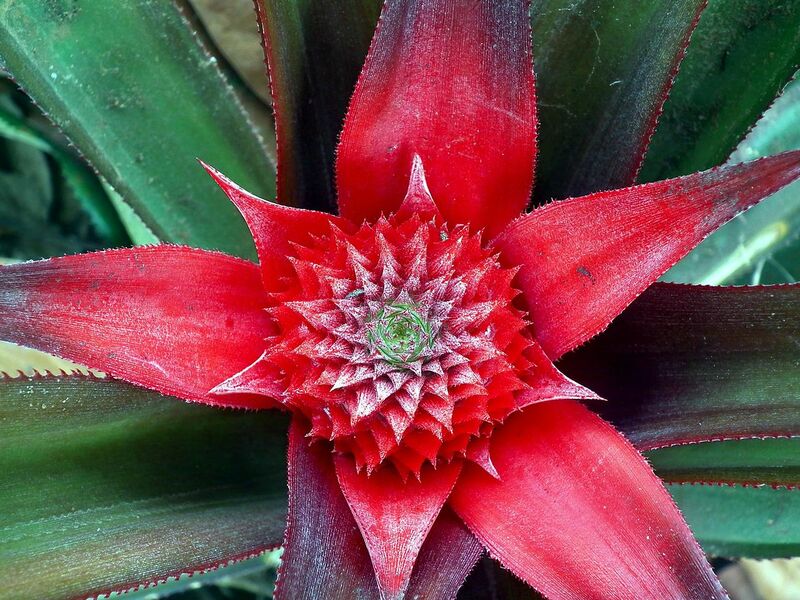 As the flower ages and the petals fall, the three sepals (the calyx) fold inwards over the base of the flower – the pineapple “eye” – and form the pineapple’s characteristic polygonal shields. Emerging from below each flower is its subtending bract, essentially a short sharp leaf. 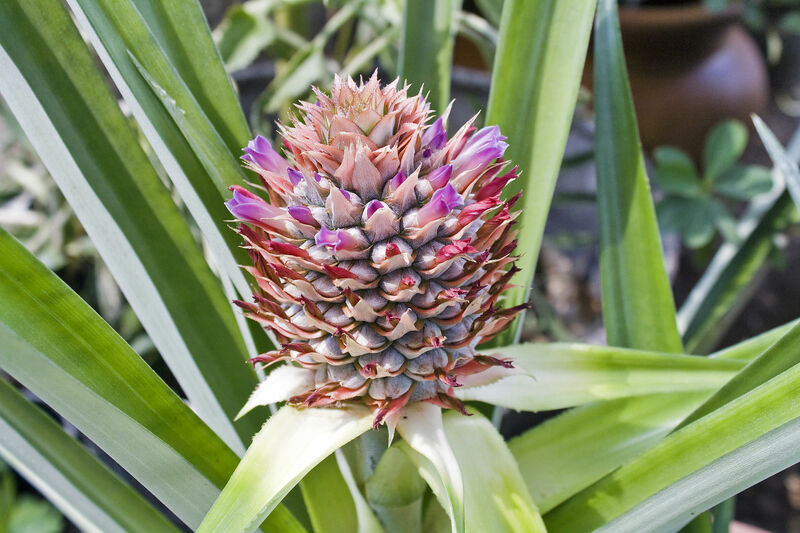 Before you cut the thick green sides away from the pineapple, take a close look at the bracts, sepals, and occasional remnant of petals that make up each flower. You might even try to pry the sepals apart and look down into the flower. Next, be sure that you have removed the crown and the bottom of the pineapple so that it will stand upright on your cutting board. Cut down along the sides, not too deep, only just under the green shell. 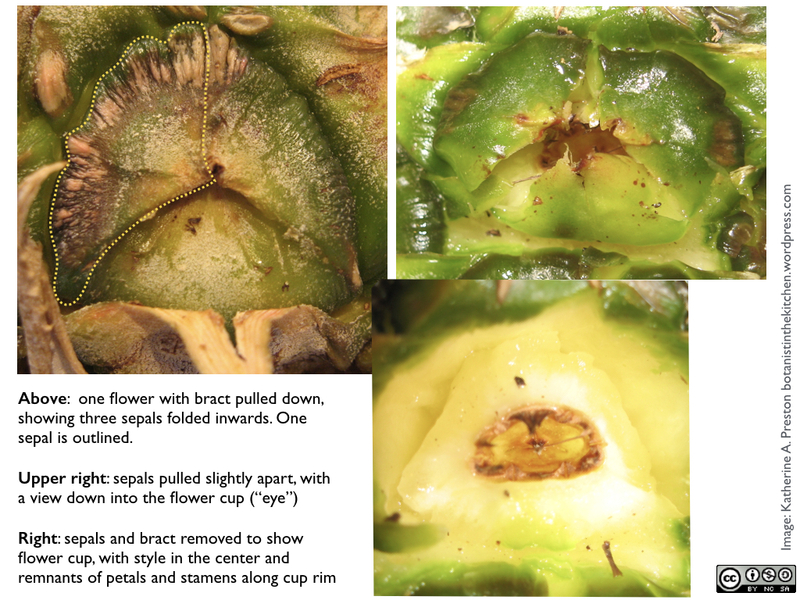 This first shallow peeling of the pineapple will reveal the “eyes,” the cups formed by the top of the ovary and the rim of the surrounding receptacle. In the center of each is the style, through which pollen grains would grow to reach the ovules inside the ovary. The rim of the cup often still carries dried bits of the petals and pollen-bearing stamens that were attached to it. Styles of individual flowers can be seen emerging from the eyes of the pineapple. Click to enlarge. At this point you have a choice to make about removing the eyes. If you just want to make a fancy trimmed pineapple, you can identify the Fibonacci spirals that connect the eyes and excavate them in long curved ditches. If, however, you want to continue the botany lesson and see the most interesting parts of the pineapple flower, you should peel the entire pineapple just a bit more deeply this time. A peeled pineapple is slippery so you might want to cut it crosswise through the middle to give you more control as you peel it again. This time, cut just deep enough to remove most of the eyes and reveal a cross-sectional view of the inferior berries. The most obvious feature of the berries is that they have three parts to match the three sepals and three petals and twice-three stamens (flower parts in multiples of three is often found in monocots, the large group of plants that includes bromeliads). Each part is composed of a carpel – homologous to an inwardly curved leaf – enclosing an open space called a locule. If the fruit produced any seeds, they would develop in these open locules from the little fringy bits (placenta and ovules) visible on the middle axis of the fruit. A more subtle set of structures are the narrow brown lines that separate the carpels. These are nectary ducts, from which nectar flows up into the flower cup to reward pollinators (Okimoto 1948). Pineapple flowers are fully capable of attracting pollinating insects or birds and setting fertile seeds if genetically distinct pollen is available, but a pineapple plant is also perfectly content to ripen a sorosus in the absence of pollination, parthenocarpically, much like a persimmon or some types of fig. You can occasionally find a small seed in a commercially-grown pineapple, but it may not be fertile. The last part of the pineapple to explore is the core running down its middle. The core will be somewhat soft in a ripe pineapple, but it is nevertheless still a stem with a support function, and it is full of indigestible fibrous vascular tissue. Because pineapples are monocots their vascular and fibrous tissue is distributed throughout the stem, rather than peripherally, so it’s best to take the whole thing out. If your vision is to serve lovely unbroken pineapple rings, it is useful to have a tool, such as a pineapple corer, which you can buy from the very hospitable Williams Sonoma. But if you don’t need to be that fancy, you can simply cut the soft parts away from the core and cube them. Even after you wash the pineapple juice from your hands, you may find that the slippery feeling lingers. Some people complain that eating fresh pineapple induces an uncomfortable tingling or raw-skin sensation in their mouths. If this happens, don’t jump to the conclusion that you have an allergy. The most likely culprit is bromelain, a catch-all name for pineapple’s cocktail of proteases—enzymes that break down proteins, including those on the surface of your hands and mouth. Proteases are diverse and widespread throughout all living organisms and serve a variety of physiological functions (Grudkowska and Zagdańska 2004). In fruit they are part of the ripening process and may also assist in defense against pests and pathogens. Some fruits—notably papaya, pineapple, fig, and kiwi—boast such an abundance of proteases that their extract is used as commercial enzymatic meat tenderizer (Bekhit et al. 2014). We don’t yet know why these particular fruits need to be extraordinarily capable of protein degradation, but that seems like a fascinating line of inquiry. The internet is full of people who swear by the tenderizing (and flavor-enhancing) power of homemade marinades made from pineapple and papaya. If you wish to harness or avoid the protein-attacking power of pineapple juice, bear in mind that proteases break down at around 150ºF, so cooked or canned pineapple won’t tenderize your meat, dissolve your Jello, or hurt your mouth. 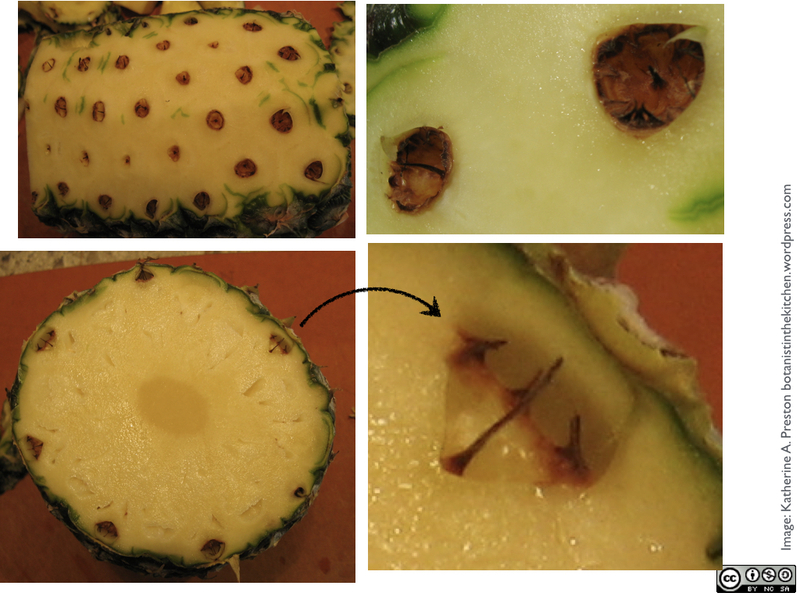 Also, the concentration of proteases declines as fruit ripens, so an under-ripe pineapple will be more bothersome (and much less flavorful) than a ripe pineapple (Rowan et al. 1990). Pineapples do not ripen any further after they are harvested, so you should be able to repurpose your centerpiece for the New Year. Just swap the red and green ornaments for some purple sparkly lights and confetti! Bekhit, A. A., D. L. Hopkins, G. Geesink, A. A. Bekhit, and P. Franks. 2014. Exogenous Proteases for Meat Tenderization. Critical Reviews in Food Science and Nutrition 54:1012–1031. D’Eckengrugge, G. C., and F. Leal. 2003. Morphology, anatomy, and taxonomy. Pages 13–32 in D. P. Bartholomew, R. E. Paull, and K. G. Rohrbach, editors. The pineapple : botany, production, and uses. CABI Pub. Grudkowska, M., and B. Zagdańska. 2004. Multifunctional role of plant cysteine proteinases. Acta Biochimica Polonica 51:609–624. Lobo, M. G., and E. Yahia. 2017. Biology and postharvest physiology of pineapple. Pages 39–61 in M. G. Lobo and R. E. Paull, editors. Handbook of pineapple technology: production, postharvest science, processing and nutrition. First edition. John Wiley & Song, Ltd.
O’Connor, K. 2013. Pineapple : a Global History. Reaktion Books. Okimoto, M.C. 1948. Anatomy and Histology of the Pineapple Inflorescence and Fruit, Botanical Gazette 110: 217-231. Rowan, A. D., D. J. Buttlet, and A. J. Barrett. 1990. The cysteine proteinases of the pineapple plant. Biochem. J 266:869–875. Spjut, R. W., and J. W. Thieret. 1989. Confusion between multiple and aggregate fruits. The Botanical Review 55:53–72. This entry was posted in Fruit, The basics, Uncategorized and tagged chemistry, history, Jeanne L. D. Osnas, Katherine Preston, morphology. Bookmark the permalink.